The Linksys Wi-Fi Router and Linksys Smart Wi-Fi Router come with Linksys Connect Setup CD that will let you easily install your router. The software allows you to configure and manage your wireless network. To learn more about the Linksys Connect software, click here. When do I manually launch the Linksys Connect software? When the Autoplay function on your computer is disabled, inserting the Setup CD that came with your Linksys Wi-Fi Router or Linksys Smart Wi-Fi Router will not automatically prompt for router installation. When this happens, you will need to manually launch the Linksys Connect software to install your Linksys Wi-Fi Router or Linksys Smart Wi-Fi Router. NOTE: If you do not have the Setup CD, or if your computer does not have a working CD/DVD drive, you can download the Linksys Connect software from the Linksys Support Site. For instructions on how to download the software, click here. NOTE: If you have a Linksys E2500 v3 router, click here to learn of its minimum system requirements. QUICK TIP: Only Linksys Connect versions 1.4.12263.1 and above are compatible with Windows 8 and Mac OS X 10.8 Mountain Lion or higher. • Make sure that you are logged in as an administrator on the computer that you are working on. QUICK TIP: This article assumes that the supplied Setup CD is already inserted on your computer’s CD/DVD drive. On the Charms bar, click the Search charm. 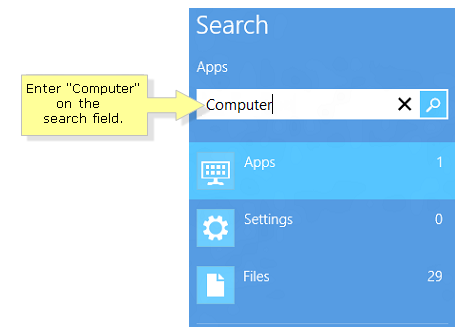 The Search window will then be displayed. Enter “Computer” on the search field. Once the results populate, click the Computer icon. Locate and double-click the icon. This should start the Linksys Connect installation. 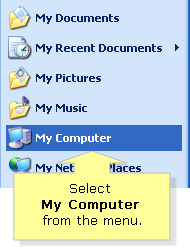 Click on the Pearl button and select Computer from the menu. 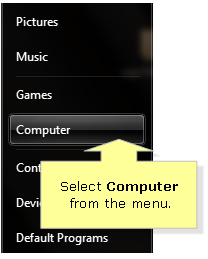 Click on the button and select My Computer from the menu. Locate and double-click the icon. Locate and double-click the Setup/Connect icon. This should start the Linksys Connect installation. Locate and double-click on the Setup/Connect icon. This should start the Linksys Connect installation. Your router has the capability to connect multiple devices in the network such as smartphones, game consoles and printers. If you have a large house with devices that require top wireless speeds and a wide range, you can also extend the range of your wireless network by using other networking devices from Linksys like the Powerline adapters. To know more about Powerline adapters, click here.